1From the ENT Division, Surgery Department, Sultan Qaboos University Hospital, Sultanate of Oman. 2Department of Pathology, Sultan Qaboos University Hospital, Sultanate of Oman. *Address correspondence and reprints request to: Rashid Al-Abri, From the ENT Division, Surgery Department, Sultan Qaboos University Hospital, Sultanate of Oman. Al-Zaabi K, Al Riyami M, Al-Abri R. A Unilateral Maxillary Sinus Tumor. Oman Med J 2013 May; 28(3):220-221. A 22-year-old male patient presented to the ENT department with complaint of progressive, painless left facial swelling over the maxillary area of 2 months’ duration. On examination, there was a 10 × 12 cm swelling extending over the left maxillary area reaching the nose medially which was tender on palpation. A 3 × 2 cm level II lymph node was appreciated at the left upper deep cervical group. Oral cavity examination revealed a swollen left side gum and hard palate with multiple dental caries. Other ENT examinations were normal. Figure 1: Computed tomography scan (front view). Figure 2: Computed tomography scan (top view). 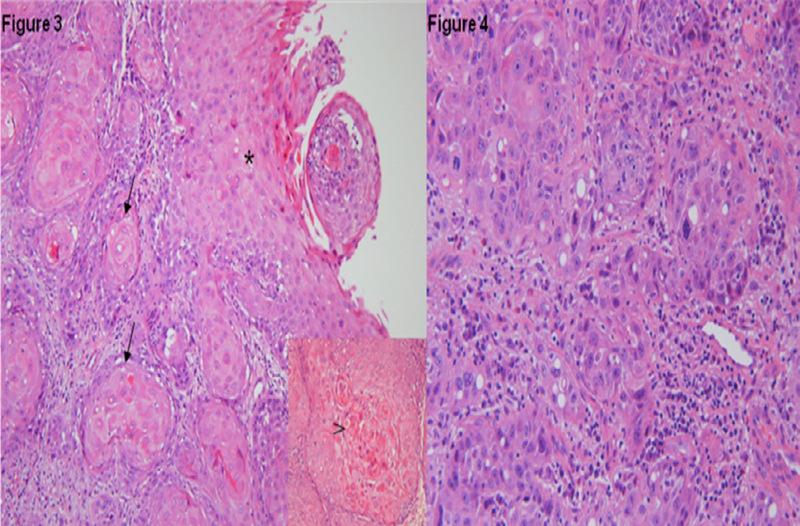 Figure 3 and 4: The biopsy from the lesion showed the histological features of the tumor. 2. 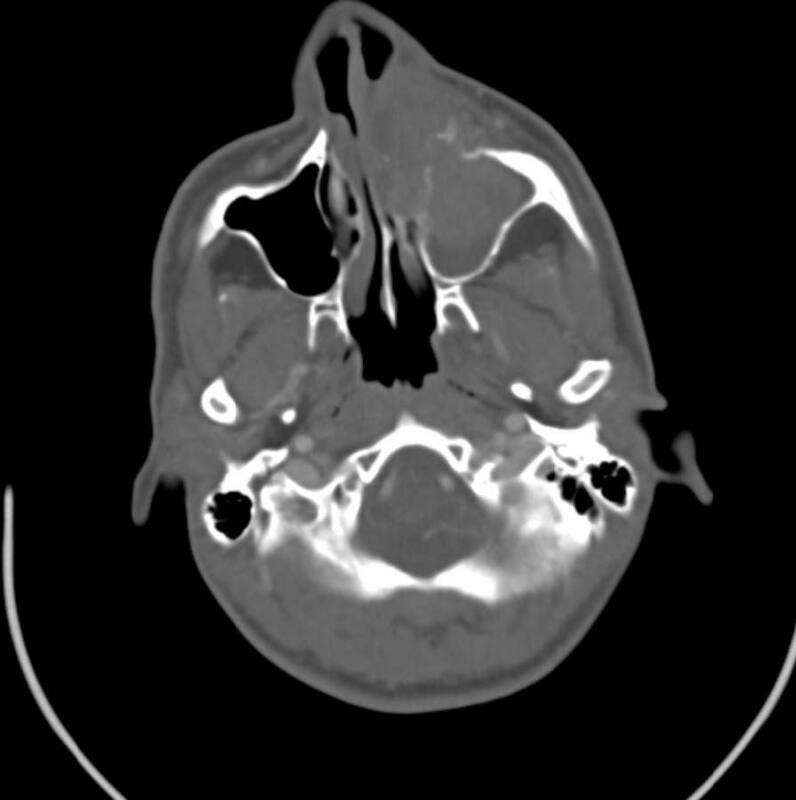 What is the role of CT scan imaging in this case? 3. What is the T stage of the tumor as seen on CT scan? 1. Maxillary sinus squamous cell carcinoma. 2. The CT scan is important in assessing the extent of the tumor and demonstrating the involvement of the adjacent bony structures. 3. Tumor causing bone erosion or destruction including extension into the hard palate and/or middle nasal meatus, except extension to posterior wall of maxillary sinus and pterygoid plates is a T2 stage tumor. Patients usually present with symptoms identical to those caused by inflammatory sinus disease, such as nasal airway obstruction, epistaxis, headache, facial pain and nasal discharge. 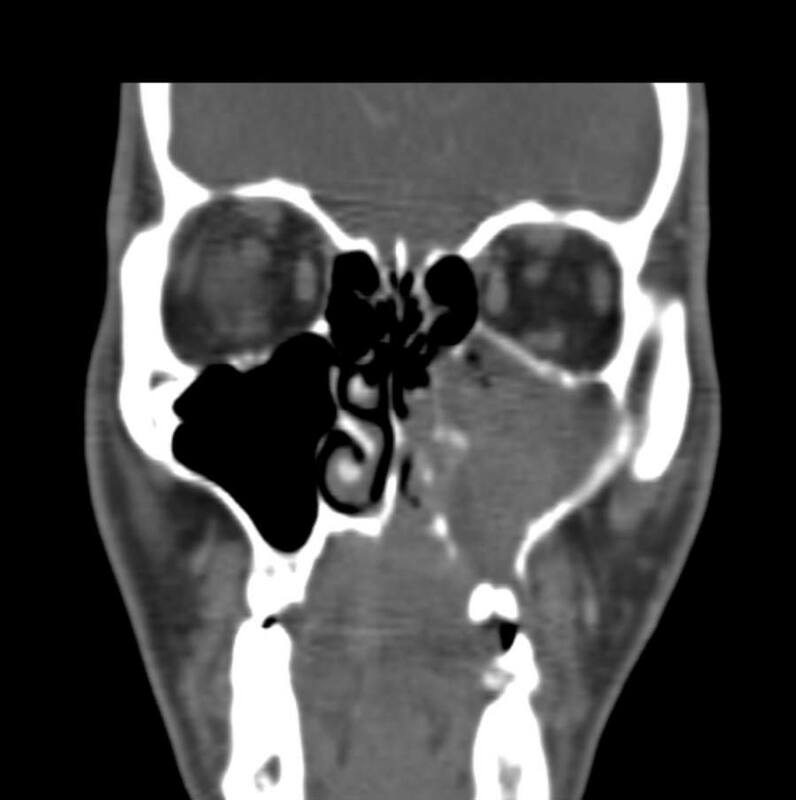 They are frequently asymptomatic in 9% to 12% of patients, contributing to a delay in the diagnosis and advanced stage of disease.6 Most SCC arises from the lateral wall of the nasal cavity with 50% developing on the turbinates.7 Imaging is an essential tool in diagnosing and staging of these tumors. Computed tomography scanning with contrast is superior for the evaluation of the bony confines of the sinonasal tract and skull base. The use of contrast provides an estimate of the tumor vascularity and its relation to the carotid artery.6 The particular benefit of magnetic resonance imaging (MRI) is its ability to differentiate tissue density and predict with excellent accuracy the difference between tumor and retained secretions in the sinuses.8 Biopsy and histopathology result can give a helpful information regarding the diagnosis. Figure 1 above showed invasive well-differentiated squamous cell carcinoma (arrows) arising from dysplastic surface epithelium (asterisk) and keratin pearl formation (arrowhead). Less differentiated areas in the tumor showing less keratinization and more nuclear pleomorphism is shown in Fig. 4. This study confirmed our diagnosis in this case. The optimal therapy of SCC is still to be defined.2 Surgery, radiotherapy, and chemotherapy are the modalities of treatment depending on the extent of the tumor and the fitness of the patient. Surgery alone can produce a high local control rate in a limited number of patients with early stage disease. However, few patients have benefited from this procedure because most patients are usually diagnosed at advanced stages.1 The combination of surgery and postoperative radiation therapy (RT) is the treatment of choice for patients with more advanced but resectable disease. Definitive RT is recommended only for patients who are medically unfit for surgery, refuse radical operation, or have unresectable advanced disease.6 In our case, a combination of surgery and postop chemo/radiotherapy with reconstruction of the face was the option for treatment. The authors reported no conflict of interest and no funding has been received for this work. 1. Isobe K, Uno T, Hanazawa T, Kawakami H, Yamamoto S, Suzuki H, et al. Preoperative chemotherapy and radiation therapy for squamous cell carcinoma of the maxillary sinus. Jpn J Clin Oncol 2005 Nov;35(11):633-638. 2. Qureshi SS, Chaukar DA, Talole SD, D’Cruz AK. Squamous cell carcinoma of the maxillary sinus: a Tata Memorial Hospital experience. Indian J Cancer 2006 Jan-Mar;43(1):26-29. 3. Ashraf M, Biswas J, Dam A, Bhowmick A, Jha Jk, Sing V, Nayak S. Results of treatment of squamous cell carcinoma of maxillary sinus: A 26-year experience. World journal of oncology Feb 2010; 1: 28-34. 4. Fukuda K, Shibata A, Harada K. Squamous cell cancer of the maxillary sinus in Hokkaido, Japan: a case-control study. Br J Ind Med 1987 Apr;44(4):263-266. 5. Al-Mujaini A, Wali U, Alkhabori M. Functional endoscopic sinus surgery: indications and complications in the ophthalmic field. Oman Med J 2009 Apr;24(2):70-80. 6. Bailey, Byron J.; Johnson, Jonas T.; Newlands, Shawn D, Head & Neck Surgery - Otolaryngology, 4th Edition, 2006.